Nutzen Sie die verlängerte Zwischenstoppzeit in Istanbul bei einer Rundreise durch die wichtigsten Highlights der Stadt vom Flughafen aus, die auf Ihre Interessen und Ihren Zeitplan zugeschnitten ist. 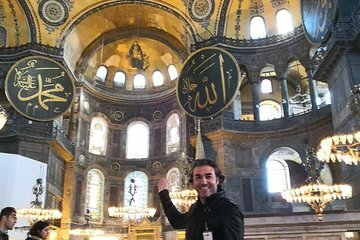 Fahren Sie mühelos zwischen berühmten Sehenswürdigkeiten wie der Hagia Sophia, dem Großen Basar oder dem Topkapı-Palast hinab und profitieren Sie von historischen und kulturellen Erkenntnissen Ihres professionellen Reiseführers. Had a fantastic layover tour with Salih -- great way to take advantage of a layover in Istanbul. Everything was easy -- from being picked up at the airport, to the private tour of Istanbul's highlights, to getting back to the airport with plenty of time to catch my flight. Salih was very knowledgeable about all of the sights and even took pictures of me and sent them to me. Highly recommend! it was very good. sorry it was so quick. only drawback was that a marathon was going on downtown Istanbul and that prevented us from seeing other sights. I highly recommend the layover tour with Iskender. He not only taught is the history of the sotes we visited but he also shared with is culture norms of the area. It was an amazing day. Thank you Iskander! My husband want to bring back our whole family to Turkey and to hire you as our tour guide. I was very happy with My Local Guide Istanbul Tour Guide; I only had time for about a 5-hr tour, and Iskender (my personal tour guide) and I covered a tremendous amount of ground, most of it on foot, as that is how I enjoy touring. He had great knowledge of the sites, spoke good English, was easy going, and customized the tour to my wishes and pace. At the airport, he helped me check in and check out my luggage at the Temporary Luggage storage place, ensuring that went smoothly. He brought me to a rooftop restaurant that provided a great overlook, perfect for photos. For a personal, 1-person tour, it was a great value. Everything went smoothly. I recommend it.